The system's in beta, so the Overwatch's word isn't law, at least not yet. 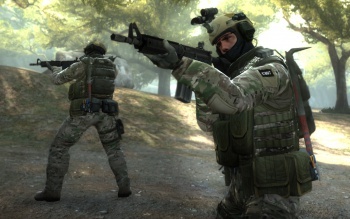 Valve's looking for a few good Counter-Strike: Global Offensive players to join its Overwatch brigade. These investigators will have the task of looking into alleged instances of cheating and griefing, and handing down a verdict, perhaps even a temporary ban. At the moment the system's in beta, so the Overwatch don't have the final say just yet; but eventually, says Valve, the training wheels will come off and "the system will become community-driven." These noble enforcers of the law will, when a case is opened, be given a replay of a randomly selected eight round segment from an accused player's match. Their job will be to determine whether or not an offense was committed within that segment. If all the investigators involved in a case agree on a verdict, a decision is made as to the miscreant's fate, but otherwise the case is tagged "insufficient evidence" and thrown out. Investigators are chosen based on account activity, and keep the job by consistently and accurately judging cases, but judging by the Steam forums there's a little confusion as to how that works in practice. There's still some reliability and accuracy tweaks to come; no doubt making the selection process a little clearer will be among the tweaks.